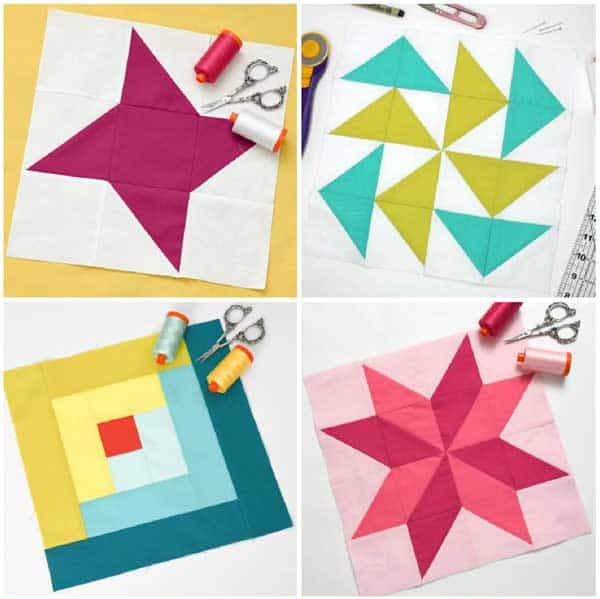 Last month Nicole gave us a fabulous tutorial demonstrating a Sawtooth Star Quilt Block that used flying geese units to create the project. This month, I want to continue where Nicole left off and help you perfect those flying geese units and make them four at a time. This technique comes in handy when you have a large number of Flying Geese to make. No dice. This is a block that’s been around so long and has been used in so many different ways it’s hard to define. I will tell you this, there is a definite difference in Flying Geese and Flock of Geese. After that, the waters are way too muddy. Step 1: Begin by laying two Piece A squares right sides together diagonally in opposite corners of Piece B. Nudge the corners in slightly. Pin to hold in place. Mark a diagonal guideline from one corner to the other. This will overlap slightly where both Piece A’s intersect in the middle. Step 2: Stitch a scant 1/4″ seam allowance on both sides of the diagonal line. Cut apart. Step 3: Press seams towards the smaller triangles. Step 4: Next, place another Piece A in the corner of one of the the previously pieced units. Mark a diagonal line from the corners. Stitch a scant 1/4″ seam allowance on both sides of the diagonal line. Step 5: Cut apart. Repeat for the other pieced unit. 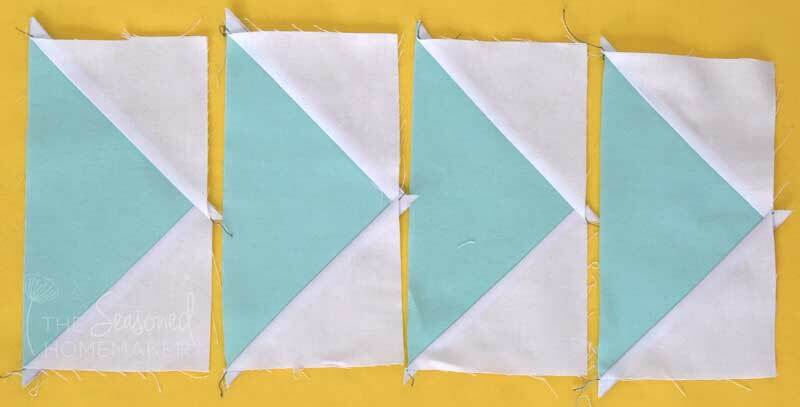 Press seams towards smaller triangles. Step 6: You now have four Flying Geese. Below is a diagram to help you better understand the process. Note: The diagram does not show the slight nudge in from the corners but the video below does show it. Notice how all of your Flying Geese Units have these little dog ears? You will want to remove these and trim the units down to 3 1/2″ x 6 1/2″. One problem that can occur when trimming is you can over-trim and not leave enough fabric for a 1/4″ seam allowance where the points meet. This becomes problematic when you’re putting these units together. All of the sudden your geese don’t have points. I’ve found the best tool to help trim down each of these flying geese units and get perfect seam allowances. It’s called the Wing Clipper. The instructions that come with this tool suggest you cut your squares slightly larger and then nudge them in from the corners. 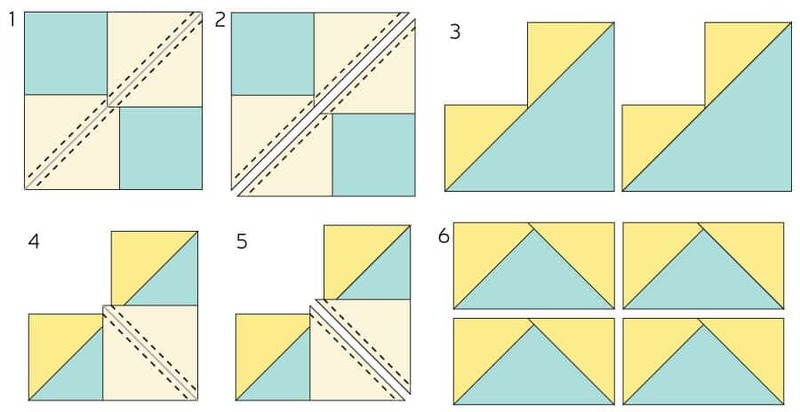 I’ve tried this method and found it to be more successful than starting with squares that are slightly smaller. There can be so much variation between seam allowances and stitch width that you could end up with flying geese units that are under sized. My good friend Stephanie from The Quilter’s Planner has a short video that explains how to use the Wing Clipper to trim your units to size. She also demonstrates how to nudge the corners in before stitching. Following these steps will insure you get perfect flying geese every single time! 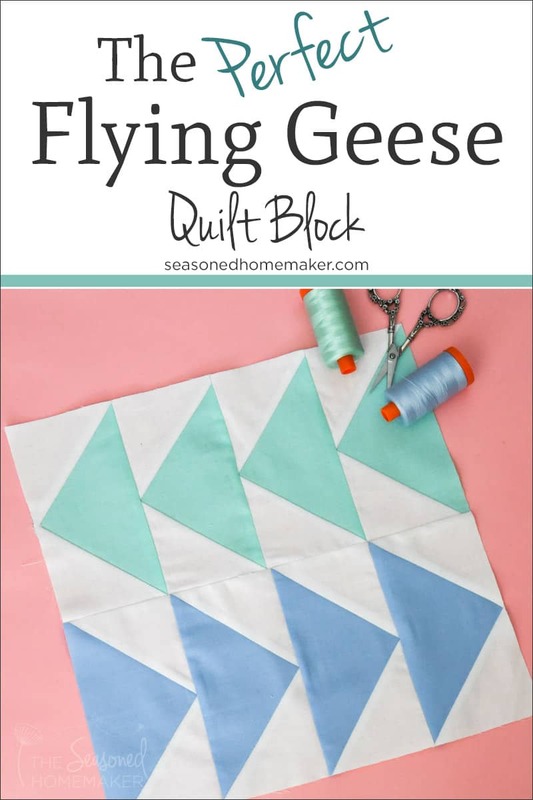 It seems like there are so many unique ways to use the Flying Geese Quilt Block. 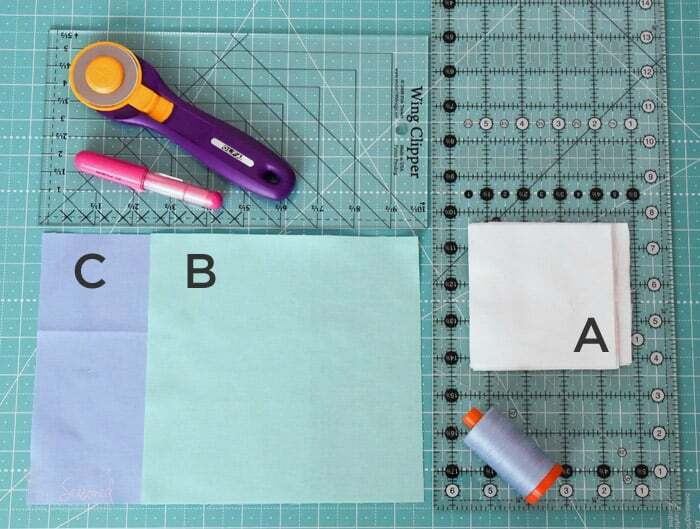 I’ve put together a Pinterest board with lots of ideas and ways to use this quilt block! Click here to see the Flying Geese board. My favorite is the mini flying geese key chain. 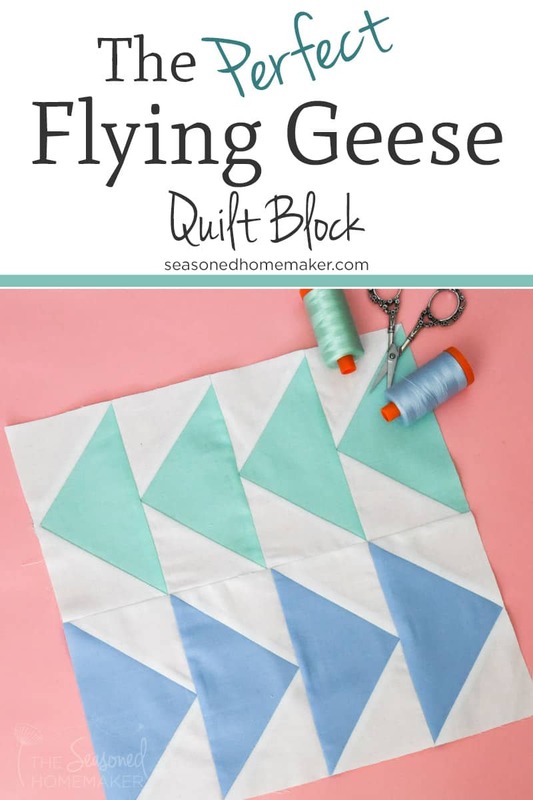 The Flying Geese Quilt Block is a great skill building block and that is why I’m encouraging you to give this one a try. You’ll be surprised at it’s simplicity and versatility. It goes together quickly and is used to make more quilts than I have time to name. The Wing Clipper has all of the different sizes to create larger or smaller flying geese. Why do you leave the tiny line of the colored fabric showing around the corners when you place your white squares on top?